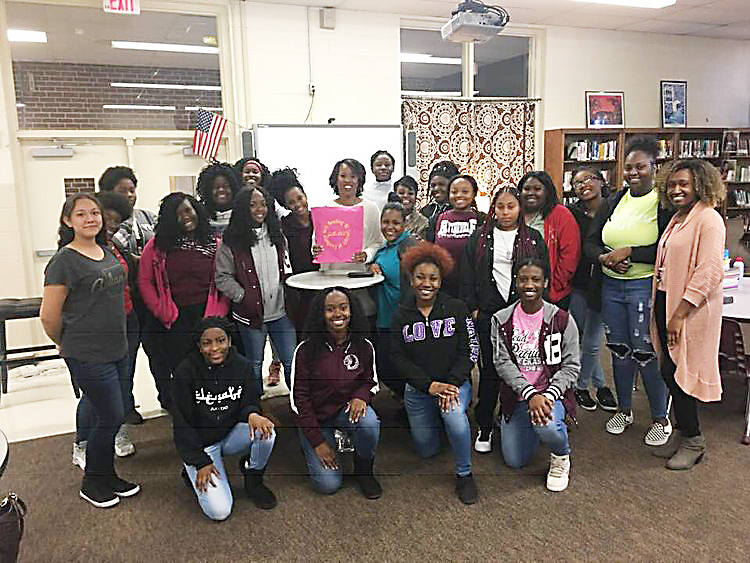 Leaders and members of “Girls Reaching All Concepts of Excellence” on Oct. 18 listened as community volunteer Rhonda Hodges (middle) talked to the girls about domestic violence. Also pictured (at right) is GRACE program director Ashley Moore. GRACE is a mentoring and youth development program, and its mission is to empower girls to become the “best versions of themselves” by equipping them with knowledge and skills necessary for success. Ashley Moore saw a video a couple of years ago about a teacher who worked at a school that consisted predominantly of black and Latino students. The teacher had developed a curriculum to encourage self-love, address the issue of low self-esteem, build confidence, combat society's standards of beauty and ultimately empower the youth - specifically, girls. Moore shared the video on Facebook, which prompted a conversation between her and other faculty members from Blytheville High School. As it turned out, they all had been entertaining thoughts about a similar program at BHS, and this was the basis for what would be the “Girls Reaching All Concepts of Excellence” organization today. Moore, chemistry teacher at BHS and also GRACE’s program director, said that GRACE is a mentoring and youth development program. Offered to girls from the ninth-12th grades, its mission is to empower young ladies to become the best versions of themselves by equipping them with knowledge and skills necessary for success. GRACE’s founding members include Moore, assistant principal Jennifer Blankenship, former English teacher Cindy Lovell, English teacher Kandace McDonald, behavior interventionist Teresa Miner, English teacher Jolene Mullet, former special education teacher Rosemary Owens, former counselor Susan Stonner and counselors’ secretary Norma Valley. Twenty-nine girls make up the GRACE roster, which began in August 2017. Both the students and the mentors focus on seven areas to nurture the learning and development of the “mentees” so they can grow into successful, productive and responsible citizens. Those seven areas include self-image and self-care, goal-setting, academic achievement, leadership, relationships, stewardship and community service. As a condition for GRACE inclusion, girls meet with their mentors twice weekly during lunch. Moore said the girls choose what goals to strive for, whether they be personal, academic or professional, and the steps needed to achieve those goals. Each girl also keeps a personal journal to monitor her goal’s progress. Moore also credited the mentors with helping GRACE to become such a positive organization at BHS. Each mentor meets with a maximum of five girls. Mentors include faculty and staff from BHS as well as members from various sororities within the community: McDonald (Delta Sigma Theta sorority), Valley (Delta Sigma Theta), Tamika Jenkins (Alpha Kappa Alpha sorority), Robilyn Key (Zeta Phi Beta sorority), Tiffany Townsend (school nurse), Sheena Williams (biology teacher/Sigma Gamma Rho sorority) and Valerie Palmore (Zeta Phi Beta). Workshops are held monthly during school hours, with such topics as short and long term goal-setting, grooming and hygiene, health and nutrition, communication and conflict resolution, healthy relationships, stewardship and college and career readiness. Another condition of GRACE inclusion is monthly community service for all girls. The members meet for “Service Saturdays” the first Saturday of each month during the school year from 10 a.m.-3 p.m. For example, recently they spent the morning serving the Mississippi County Union Mission, and later in the day spent time at Stonebridge. Moore and the mentors provide girls with enrichment activities to promote self-confidence, positive relationships, leadership and community service as well as to help them acquire knowledge and skills. “The enrichment activities are something we're striving for in the future,” Moore added. “As the program acquires more funds we hope to implement all of these activities in addition to the group mentoring, workshops and community service outings. For more information, visit www.gracementorship.org.